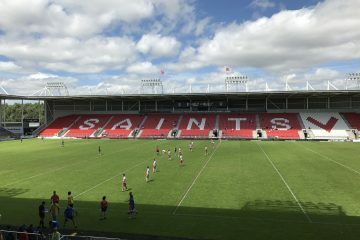 If the squad is far better than last year, then it shouldn’t be seemingly crippled by the injury to Matty Smith – who’s sole contribution so far has been 38 mins of a Pre Season friendly. As for knee jerk – is he wearing blinkers to go alongside the headphones? 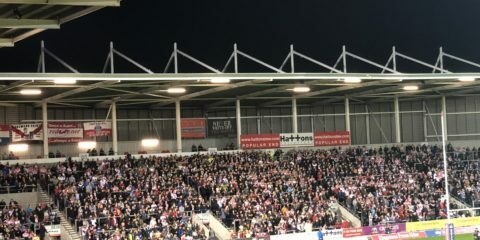 Unfortunately this has been rumbling along for nigh on 18 months – the atmosphere in the loss at home to Warrington last season was toxic, and at the time led us to call for him to be sacked, before we rallied to win 11 out of the last 13. The atmosphere is once again heading that way, and judging by the comments on the terraces, on social media, around the town and in the workplaces, the vast, vast majority have reached the end of their tether. You will be very hard pressed to find a Saints fan out there willing to stick their heads above the parapet and defend the Coach at this moment in time. The same issues that have plagued us for the last few years: poor ball retention, ‘the grind’, stupid penalties, the ability to drop ourselves in a huge hole in the first half of games – haven’t been addressed, regardless of personnel in the team, so who’s fault is that? Generic Coach speak – but all of this should be a given for any top flight professional sports team? I don’t get this comment at all – have we as a club fell so far down the scale, that we would be that unattractive to potential coaches should the chance to manage the club become available? Comments such as this – basically saying there’s no point sacking him as no one else would want the job, is absolutely bizarre! Wait – we’ve just been told the squad is far better than last year? We were awful against Leeds and Leigh with Jonny in the team as well!? Don’t all clubs have injuries? Whilst i’m sat writing this watching Wire and Wigan, Joe Burgess is injured and they’ve got a kid on the wing who’s just scored a hat trick in the first 48 mins….other teams cope, why can’t we? This just comes across as excuse after excuse, with everything seemingly pinned on the return of Matty Smith. If the players are such a good group, then questions need to be asked as to why they’re letting the coach down so much. It doesn’t explain why the tactics are poor and the skill level is so poor? Why the defence was so piss poor v Leigh? Why our players constantly receive the ball from standing starts? Why nobody in the team runs lines off the ball? Why we only seem capable of kicking penalties to touch and gaining under 5m in field position in doing so? Why we kick so often on the 3rd tackle? Why Jon Wilkin’s kicking repertoire consists of that terrible bomb? Fans are being patient with Danny Richardson – seemingly the only person being impatient with Danny Richardson seems to be KC himself. KC talks of us ‘flying in pre season training’ with Smith, but one injury means this hasn’t translated to performances on the park. Have we no Plan B? The answer so far is a resounding No. Maybe a bit of that is true, but it’s all if buts and maybes – but our halves certainly weren’t the main reason we lost that game, not by a long way! That’s quite correct – it is a results based industry, and we can’t sit waiting – but the majority of the comments in the article are from KC keep telling us all to be patient until Smith returns! Now I’m just completely confused?? Theo is nearly 23, he’s played nearly 90 Super League games, he should be experienced enough by now to at least help guide us round the park to a level that keeps us competitve? We haven’t got the luxury of waiting until he’s 26 or 27 to fulfil the role. He’s right – the big men aren’t anywhere near good enough at present – they’re looking bullied by whatever opposition they face, the backs are doing all the dirty work carrying the ball early in sets, yet our forwards constantly look like they’re blowing out of their arses! But KC told us this is his best ever squad…so what exactly is going on? The worrying aspect is if this is really what he believes and is being fed back to the squad, then nothing will change – the same problems will persist, and I can’t see where the next win Is coming from.34 points in 3 games against opposition of Leeds (Awful despite their stature), Leigh and Wakefield is nothing short of a disgrace. Can anyone tell me if we’ve ever scored less points in the opening 3 games of a league season? 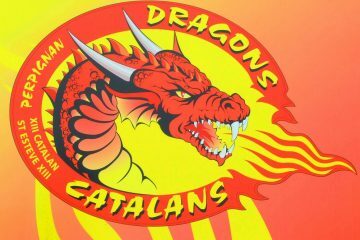 Keiron has told us prior to the season that this is his team – so he needs to take full responsibility for the results and performances. No more empty words, no more excuses. Good article combining many comments from posters into one read. Pity no one from the club is answering the questions you pose. Very succinct! Clearly our coach is living in a different time zone to the rest of us. To say that there is no-ne else available if he goes is delusional . The situation must be addressed now before it becomes completely unmanageable.